‘You’re a mermaid!’ | Runner. Writer. Renegade. It’s well known — at least by all of us — that runners get little recognition and fanfare compared to athletes in other sports. With few exceptions, the average person would recognize few of the world’s top running athletes. Heck, even as a local champion, you’re probably less recognized than say, the local high school quarterback. That said, runners tend to do a slightly better job of knowing who’s who in their own sport, although there’s definitely three distinct camps: those who follow collegiate cross country and track, those who follow professional track and those who follow marathons. These lines cross, of course, but those who would recognize Ryan Hall wouldn’t often also recognize Ryan Hill. Generally speaking, I would say male runners between the ages of 18 and 22 have the best “institutional knowledge” as it were. This year, we tested it at our Derby City Athletic Club running camp in the Smokey Mountains. To some extent, we test this knowledge at camp every year during an annual trivia session, but this year the quiz was more, well, hands-on. An example question: What athlete cheered on a teammate by yelling things like, “You’re a mermaid!” and “You’re huge!”? This was an actual question. Many of our campers knew the answer, because it quickly became a group favorite when it appeared on Flotrack in May. 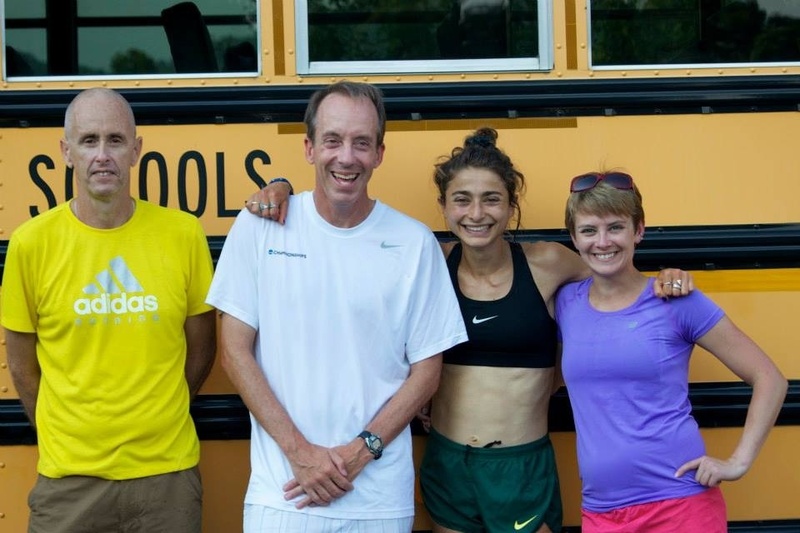 If you don’t know the answer, search for Alexi Pappas Peyton Jordan. It’s worth every second. Alexi Pappas, a steeplechaser/1500 runner and graduate student at the University of Oregon, was filmed cheering on teammate Jordan Hassay during the Peyton Jordan invite. The video has been edited to include just the part of the race where Jordan comes by Alexi each lap. And each time, Alexi has something hysterical to say. No doubt Jordan was either laughing or completely dumbfounded every lap. Either way she was surely entertained. When I found out she’s a grad student just five years my junior, I announced that meant we could be best friends. We smuggled her in, top secret cargo to surprise the campers. We hoped they would be as excited as we were. Alexi had a workout scheduled for the evening she arrived, a short workout to keep her ready between the USA national championships in Des Moines and a smaller race in Vancouver. So, we rounded up a group of pacers: about eight high school guys, all amongst the state’s best, with various state titles to their names already. We drove over to a local elementary school that had a walking path — Alexi said she preferred to not be on a track. The pacers still didn’t know what was going on, just that they were going to do a special run. Eventually, as we waited at the track, we told them there was a surprise guest. And that it was a girl, and one that they would know. One guy guessed it right — and by the time he was halfway around the walking path, there she stood. They were as excited as we hoped and they did a great job pacing her. We shot tons of video and hope it’ll be included as one of Flotrack’s Workout Wednesdays soon. Alexi stayed for the remainder of camp, another day and a half, going on three more runs with the campers. She also visited Gatlinburg for the first time, which can be a startling experience. She talked to our campers about team, about trying hard and supporting each other. She made friends, promised to stay in touch, signed autographs and posed for a hundred photos (at least). The campers loved her. As I write this column, Alexi is preparing to run her race in Vancouver — her first as a newly-signed member of the Oregon Track Club. Although she might wear the OTC jersey, we will always consider her a member of DCAC, too. Alexi was down to earth, not intimidating or egotistical — exactly the kind of person we’d all like to see represent our sport. If you don’t know who she is — and definitely if you haven’t seen the video — look her up. ← Congratulations — it’s a baby park!